Gov. 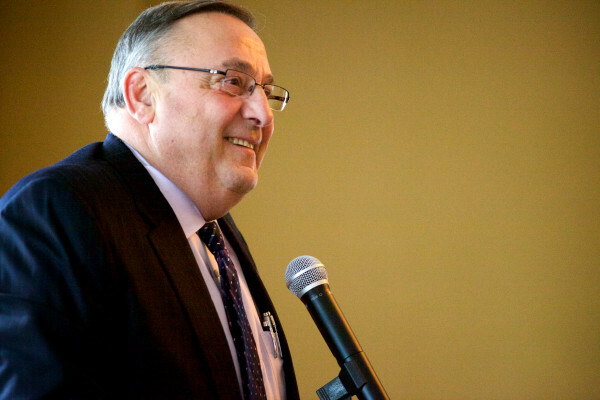 Paul LePage speaks to the Southern Midcoast Maine Chamber in Brunswick on Thursday morning where he touted his $6.57 billion biennial state budget proposal. AUGUSTA, Maine — The governor wants to level the playing field between formal lodging places and homeowners who rent out rooms, homes or cabins to travelers, not by licensing the homes, but by de-regulating all hospitality businesses. The comment by Holly Lusk, senior health policy adviser for Gov. Paul LePage, was made Monday morning during a public hearing by the Legislature’s Health and Human Services Committee on a bill that would require all providers of short-term lodging be licensed by the state. The hearing drew about 50 speakers, and testimony on the measure went on for nearly 3 hours. Lusk said the governor did not support the legislation before the panel, preferring instead to remove any licensing requirements currently in place for lodging businesses. She added that any formal proposal to end such licensing requirements, however, would likely come during next year’s legislative session. She said after such action, DHHS inspectors could then be shifted to inspect restaurants. A Department of Health and Human Services license now is required for any building where sleeping accommodations composed of four or more rooms are offered by a business. The bill that was the focus of Monday’s hearing was LD 436, sponsored by Sen. John Patrick, D-Rumford. Patrick said the bill was necessary for the safety and health of the public and out of fairness to lodging businesses that are required to obtain state licenses. Among the people speaking out for the bill was Rockland Mayor Frank Isganitis, who addressed the committee as co-owner of the Limerock Inn in Rockland. Rockland officials have held a series of meetings on whether to require licenses for homeowners who are renting out rooms. It is an issue that other communities around Maine and the country are struggling with as more travelers are turning to a growing number of rooms, apartments and houses that are rented for short-term stays through such websites as Airbnb.com. Some lodging businesses have complained that some of the informal rentals violate state and local laws, including safety, tax and zoning regulations. Isganitis said Monday that the rights of the king of a castle should be regulated when it adversely affects the neighboring castle and the overall kingdom. Tom Connelie of the Black Lantern bed-and-breakfast in Topsham said the homeowners who advertise on sites such as airbnb.com are in direct competition with him yet they often do not meet the safety standards that he has to meet. He said, for instance, that windows have to be a minimum size in the event a person needs to get out through that window. Greg Dugal, executive director of the Maine Innkeepers Association, said the bill simply took a common sense approach to the problem. Audrey Miller, president of Vacation Professionals of Maine, argued, however, that the bill was not worthy of the committee’s time. Miller said the bill would not level the playing field but was a way for large lodging businesses to bully the smaller ones. She said the additional standards required of people who rent out rooms or cabins would put hundreds of people out of business. Nicole Fuller of Rockland said she purchased her home two years ago with the intent to rent out rooms as a way to pay for the home. Fuller said she pays lodging and income taxes and has installed smoke and carbon monoxide detectors. The Rockland homeowner said Maine would lose out on a certain demographic of travelers if homes such as hers were not allowed to offer short term rentals. Lynn Luzzi of Rockport agreed, saying the bill would negatively affect the tourism industry in Maine. She said it does not make sense to require homes to meet the same standards as commercial establishments. “This bill targets the elimination of an alternate philosophy of travelers’ lodging,” she said. Penelope Ray of Rockport said the bill would add red tape. “One thing Maine does not need is more red tape and bureaucracy,” Ray said. The legislative committee next will hold a workshop on the bill before taking a vote. No date has yet been set for the workshop.